Rory McIlroy will be "disappointed" if fails to cap his stellar year with victory and the $10m (£6m) bonus in the PGA Tour's end-of-season FedEx Cup. McIlroy, 25, has won four times in 2014, including the Open and US PGA, to go back to world number one but wants more at this week's BMW Championship. The Northern Ireland player is second on the season-long FedExCup points list behind Chris Kirk with two events left. "I really want to cap off this summer as best as I can," he said. McIlroy won two of the four play-off events in 2012 to arrive at the Tour Championship finale in top spot, but lost out to American Brandt Snedeker and missed out on the $10m first prize. 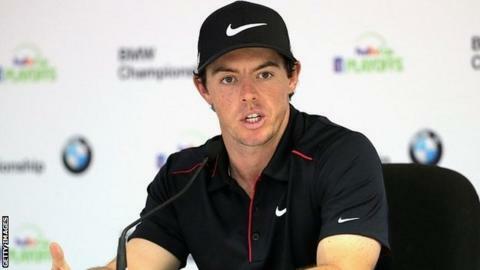 "I still got compensated pretty well for second place, so it wasn't too bad but I feel like it's been such a great year on the golf course that if I wasn't to go ahead and win the FedExCup, it would definitely be disappointing," said McIlroy ahead of this week's penultimate play-off event at Cherry Hills Country Club outside Denver. "Not winning a couple of years ago did add a little bit of fuel to the fire and probably makes me a little bit more determined to try to win it this year." The top 70 players on the FedEx Cup points list after last week's Deutsche Bank Championship qualified for Denver, with only the top 30 players advancing to the Tour Championship finale which begins on 11 September. Northern Ireland's Graeme McDowell is 53rd in the standings after missing last week in Boston to be at the birth of his first child, while England's Justin Rose (27th) and Phil Mickelson (56th) are also in danger of missing the climax in Atlanta.